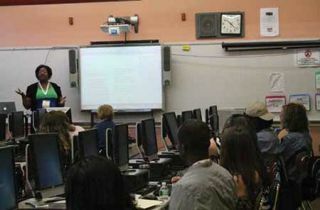 NYC teachers learn new skills at a technology summit. Luckily for Wong, she was able to take Social Media to Support Teacher Effectiveness, a class taught by Nielsen, who is director of digital engagement and professional learning for NYC Public Schools. The class is designed to share ways teachers can use social media to meet teacher-effectiveness requirements. Nielsen also teaches Creating a Digital Portfolio to Support Teacher Effectiveness, which focuses on creating a digital portfolio to showcase evidence and artifacts of teacher effectiveness. As Wong went through each component of the Danielson Framework and uploaded artifacts, it helped her to better understand her areas of strength and weakness and to reflect on how she needs to change in order to grow. “I find by using technology for an authentic purpose in my own life, it is then easier to give assignments to students since it is not just busy work, but something that has relevance,” she says. NYC teachers can take any of the dozen classes Nielsen teaches and use that material to teach others back at their own schools. The district designates professional development time every Monday. The professional learning opportunities are listed online and Nielsen promotes them to teachers directly, via her department’s Web site and newsletter, and to principals who can suggest them to their teachers. “We have a tech-savvy person identified at each school called the Technology Single Point of Contact (Tech SPOC) who takes our classes and shares with their colleagues,” she says. NYC isn’t the only district trying to better its evaluation process by offering teachers concrete methods to strengthen their skills. Here are two other examples. A captive audience of NYC teachers during a tech summit in 2014. “When we reflected on our teacher evaluation process, we knew we wanted to find a way to truly individualize the practice,” says Vanessa Belair, assistant principal at Delta Elementary Charter School in Clarksburg, CA. “We all have different strengths and areas of potential growth.” The K-6 school uses Insight ADVANCEfeedback, a growth-centered observation and feedback platform for teachers and administrators. “Since transitioning to Common Core, we have been asking our students to essentially learn and think differently. The standards that we have for teachers need to change as well. Insight’s Common Core Framework has given us a tool that has changed the way we evaluate teachers.” The school finished its first round of formal evaluations in March. Each teacher made personal goals associated with a core practice. Each teacher also received professional development, including peer coaching, visiting schools to observe teachers, and release time to work with Belair. Some teachers viewed video clips about specific strategies on TeachingChannel (teachingchannel.org). Belair does weekly observations and gives short feedback, but she knows the magic happens when teachers can incorporate what they are learning in the moment. Delta Elementary Charter School teachers present lessons to each other. “We strongly believe, with the right targeted support, all of our teachers will be successful,” says Belair. “Often it can be as simple as equipping a teacher with specific strategies and techniques.” Although there is continuous, whole-staff PD around engagement practices, Common Core, data, and other educational topics, our true goal has always been to individualize PD and tie it directly to our evaluation process. “We differentiate for our students so why not for our teachers?” she asks. Spurred by a U.S. Department of Education Teacher Incentive Fund (TIF) grant awarded in 2010, Fort Worth (TX) Independent School District piloted a multi-faceted teacher evaluation and PD initiative to improve teacher effectiveness at 14 underachieving schools that suffered from high teacher turnover. “The grant required us to measure teaching effectiveness based on teaching performance and student performance,” says Andrew McKenzie, TIF Project Manager at the district. During the 2010-11 school year, McKenzie pulled together a committee of teachers and administrators to choose an alternative rubric from the state’s system to measure teacher effectiveness. They also wanted something that would create wider data to pull from. They chose the Danielson Framework for many reasons, but particularly because it describes performance—not people—and encourages rich, in-depth, focused discussions between the teacher and evaluator. The district offers face-to-face courses in classroom management and other areas and can enroll teachers when there’s a need. It also offers targeted PD, in which an instructional coach comes in and works with a teacher. But PD is taking a new turn since the district partnered with Teachscape last year and started using video for observations. Now teachers can check out observation kits, put their iPads on Swivl, and then upload their videos to the Teachscape Learn platform. They can use the videos for self-reflection or share them with coaches, administrators, or partner teachers. Ft. Worth teachers have begun videotaping themselves to improve their practice. “The first couple of years, it was a challenge to figure out what to do between observations, but we are figuring out ways to handle that,” says McKenzie. For instance, when administrators notice areas to be addressed during an observation, they can share feedback they’d like a coach to address. They can also ask teachers to complete modules from online platforms that are cross-referenced with the framework. What’s nice about the modules is that they are specific and can be completed at the teacher’s convenience. Administrators can also watch the progress. McKenzie says the campuses using this method have had positive feedback. The videos are also starting to be used in professional learning communities (PLCs) and training sessions. Instructional coaches film teachers or themselves doing a demo lesson or something exemplary and then share the videos with their teams. “Our literacy coach filmed a small-group guided reading lesson and used the video in a PD session in the fall that was immediately impactful,” says McKenzie. As teachers become more comfortable with the framework, they have begun self-identifying their weaknesses and seeking help on their own. “We have teachers who have been in the system for some time and have become familiar with the rubric who say, ‘I’m rated here and want to get to here. What can I do?’ They ask their administrators, and it’s a good problem to have,” says McKenzie.